Swapartment - Visiting Querétaro, Mexico I. Are you looking for a place in Mexico where you can eat, stroll, enjoy the outdoors, and learn a bit of history? You will find all of this in Querétaro, one of Mexico's safest cities - and one of its fastest growing. What makes Querétaro special? 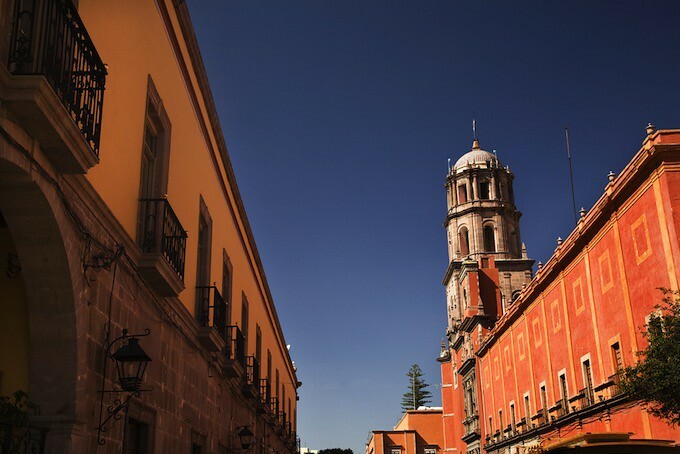 It doesn't take the traveler long to discover Querétaro's most notable offerings: the aqueduct, the plazas, and the local delicacy, enchiladas queretanas. Querétaro's aqueduct is a striking visual symbol that once served a practical purpose: bringing water to the city from nearby natural water sources. It is now an admired attraction that can be viewed and photographed from various vantage points. The aqueduct consists of dozens of 20-meter high brick arches; residents usually refer to it as "Los Arcos" (the arches). It was completed in 1738, built with generous funding from el Marquis del Villar de Aguila, who is featured in a statue in the center of Querétaro's main plaza. The plazas are the heart of Querétaro's Centro Historico. They are also great places to find food, arts, and entertainment. Plaza de Armas, the main square of the city, is located between Corregidora and Luis Pasteur boulevards in the Centro. This plaza is in front of the Government Palace, an old building where the famous Corregidora herself, Doña Josefa Ortiz de Dominguez, passed a message through a keyhole to secret conspirators to help kick off the rebellion against Spain in 1810 that led to Mexican independence. Heading west from Plaza de Armas, stroll to Jardín Zenea (Zenea Garden), which features a small pedestal concert stage along with more statues, more greenery, and more festivity. Just south of Jardín Zenea is the Plaza Constitución, and Jardín Guerrero is found a couple of blocks west. There is also a smaller but always buzzing plaza at the corner of Ezequiel Montes and Arteaga streets, across from the Templo de Santa Rosa de Viterbo. There, the fountain features a light show accompanied by dramatic classical music. Getting hungry? Enchiladas querétanas are a local food specialty. These aren't just any cheese or chicken enchiladas. The small, stuffed tortillas are drizzled with the regionally popular crema and topped with cheese, carrots, and potatoes. Many restaurants around town sell enchiladas querétanas, usually ranging in price from 30 to 70 pesos for the entrée. Look for one of the many Centro restaurants with a sandwich board advertising enchiladas, or if there is a festival happening in one of the plazas, you are likely to find a food vendor selling them. Querétaro International Airport has daily flights from the U.S., connecting through Dallas or Houston. Passengers who fly into Mexico City's Benito Juarez Airport can take a bus directly from the Mexico City terminal to Querétaro's central bus station; from there, it is a short cab or city bus ride to the Centro.